The book alternates between Julia's story and a more traditional quest-y storyline that you would find in most fantasy novels. The quest seems a bit undercooked, but Grossman's portrayal of Julia is both beautiful and heartbreaking for reasons that become clear in the final pages. The prose can be clever bordering on smug; Grossman wants the reader to know that he is deconstructing the ponderous formalism of the genre and much of his writing is quite funny, but it eventually feels like he's showing off. I'm tempted to begin the third installment immediately, but I think I'll let this story sit with me for a while before returning to Fillory. In the meantime, I should really check out the Syfy series based on the books. 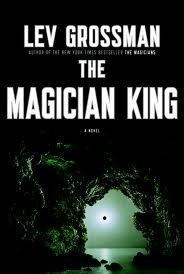 Sign into Goodreads to see if any of your friends have read The Magician King. I agree with this review 110%. I loved this series, but smug is a very apt way to describe many passages. That said, having spent a lot of time reading this genre, some of the sly rancor is deserved. I really enjoyed Julia being developed as a character. I felt little for her in book 1, and the second book changed that. The series is great, but departs from the books very quickly. Still a fun watch!